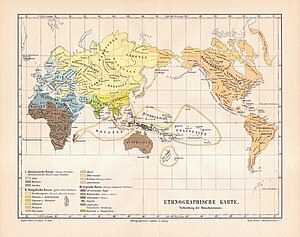 The 4th edition of Meyers Konversationslexikon (Leipzig, 1885-1890) shows the Caucasian race (in blue) as being made up of Aryans, Semites and Hamites. Aryans are further split into European Aryans and Indo-Aryans. The people called "Indo-Aryans" on this 1890 map are today known as Indo-Iranians, and the word "Indo-Aryan" is only used today for those Indo-Iranians from northern India. The Aryan race is an idea that was formed in the 19th and early 20th century. The term "Aryan" comes from the Rig Veda and is the name of an ancient group of people in ancient Persia and India, who spoke an Indo-European language. It has been used to describe people of Iranian and Indian descent, but there was no record of Aryans in European history. Later it was used for Germanic peoples because of new ideas about the Aryans. The term Aryan comes from the ancient Sanskrit word ārya, which was a term used by Sanskrit speaking people to distinguish themselves from other races. The Iranians also used the terms, and the name Iran means "land of the Aryans". The idea of an Aryan race was first used as a category of people but was later used by occult movements such as Theosophy. It was also later used by Nazis and white supremacists in racist ways. The ideology of Nazism was based upon the idea of the Aryan race or Germanic peoples being a master race. The Nazi view of the Aryan race came from earlier racial theorists such as Arthur de Gobineau and Houston Stewart Chamberlain. As the leader of Nazi Germany, Adolf Hitler, became set in his ways, he decided with proclamations that some other groups of people were also Aryans along with Germanic peoples. He declared Hungarians to be "Aryan" in 1934, the Japanese were made officially "Aryans" in 1936, and the Finns were officially added in as "Aryans" by his proclamation in 1942. However, Nazi Germany did not regard Slavs as "Aryans", but as inferiors and non-Aryan. They also would not recognize Italians as "Aryan", although Italians under Mussolini wished to be included as "Aryans". Theosophy, a mystical occult society founded in 1875 by Helena Blavatsky believes that the Arabian people and the Jews are a part of the Aryan race. It is believed by Theosophists that the Arabians used the Semitic languages of the people around them. These people had moved to the area from Atlantis. Theosophists claim that the Jews began as a part of the Arabian subrace in what is now Yemen around 30,000 BC. They moved first to Somalia and then to Egypt where they lived until the time of Moses. ↑ David W. Anthony (2010): The Horse, the Wheel, and Language: How Bronze-Age Riders from the Eurasian Steppes Shaped the Modern World. Princeton University Press. P. 7-10. Retrieved 25.07.2016. This page was last changed on 24 February 2019, at 18:42.